Wundercloud! : My little kid, Arthur...! It took me two days to bring my little Arthur to life. 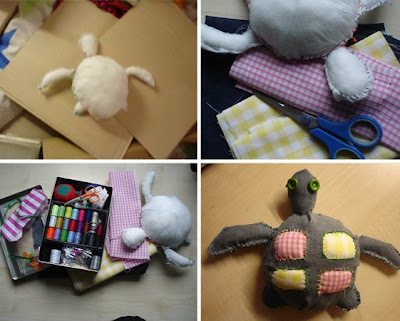 He was originaly made to star in some animations for my website "Save our oceans". Unfortunately I didn't have the time in the end to use him . 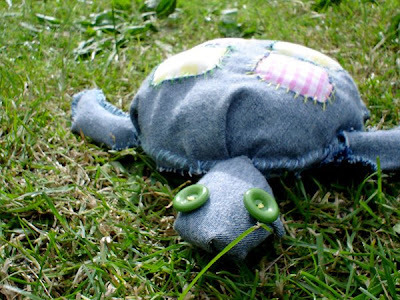 He still is my beloved first handmade toy though. His body is made from wire so that he can move his head and parts. 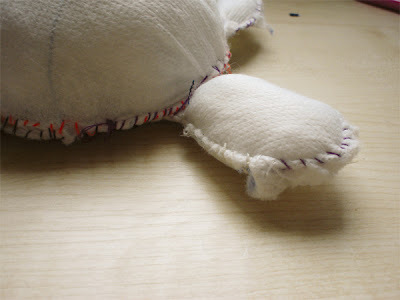 He has fluff from a pillow for filling, various fabrics for his turtle skin and buttons for his nice eyes. On the pictures you can see some of my work process and finally his latest excursion on the park.